Good St. Francis, you loved all of God's creatures. If it is your will, restore it to health andstrength. whatever weakness of body they have. 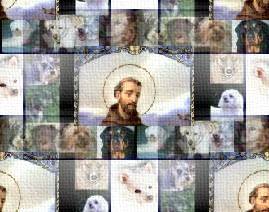 St. Francis of Assisi, who honored You through all Your creatures. giving You honor forever. Amen. Thank you Joyce for sending this prayer to me! Your pet does not have to be diabetic to be included on this page. you again! I love you Queenie!! Please enter a Prayer for A pet in Need in the Prayer GuestBook!